W. S. Di Piero, winner of the 2012 Ruth Lilly Poetry Prize, is the author of twelve books of poetry, most recently Mickey Rourke and the Bluebird of Happiness (Carnegie Mellon, 2017). Of his poems, Lisa Russ Spaar exclaims, “Oneiric, kinetic, cinematic, fugal, inclusive, Di Piero’s…lyrics, litanies, and prose poems arrest the reader not only with his familiar acid bite of voluptuous street-wise music, his mix of Old and New World confluences, but also with an intensified and intimate vulnerability, complicated by fear, the aging body, the inexorability of change, and a restive, ‘fatal cherishing’ of this world.” Di Piero’s other poetry collections include Tombo (McSweeney’s, 2014), Nitro Nights (Copper Canyon, 2011), Chinese Apples: New and Selected Poems (Knopf, 2007), Brother Fire (Knopf, 2006), and Skirts and Slacks (Knopf, 2001). 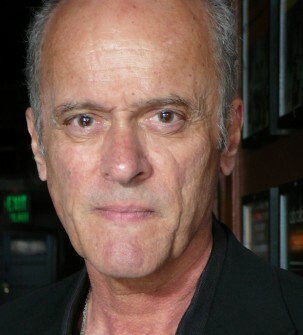 His poems have appeared frequently in Poetry, The New Yorker, and Threepenny Review, and he has written for The New York Times Magazine, The New York Times Book Review, The New Republic, and other periodicals, and he also writes a monthly column on the visual arts for an independent newsweekly, The San Diego Reader. His autobiographical essays have appeared twice in Best American Essays. His books also include translations from Greek and Italian. A well-known essayist on art, literature, culture, and personal experience, the latest of Di Piero’s five essay collections, When Can I See You Again? (Pressed Wafer, 2010), contains his recent art writings. Other art essays include Shooting the Works: On Poetry and Pictures (Triquarterly, 1996) and Out of Eden: Essays on Modern Arts (University of California Press, 1993). An accomplished speaker on these subjects, his lecture “Poets and Painters” explores the conversation between the languages of the written word and the visual arts by looking at his own poetry and the work other poets (Baudelaire, Rilke, Browning, Pound, William Carlos Williams) who have known or written about visual artists (Delacroix, Cezanne/Van Gogh, Renaissance painters, modern contemporary artists). Di Piero has been the recipient of a Guggenheim Fellowship, a National Endowment for the Arts grant, and a Lila Wallace-Readers Digest Award. He lives in San Francisco. W.S. Di Piero is the author of twelve books of poetry, including, most recently, Mickey Rourke and the Bluebird of Happiness. Winner of the 2012 Ruth Lilly Poetry Prize, his poems have appeared frequently in Poetry, The New Yorker, and Threepenny Review, and he has written for The New York Times Magazine, The New York Times Book Review, The New Republic, and other periodicals. Di Piero has been the recipient of a Guggenheim Fellowship, a National Endowment for the Arts grant, and a Lila Wallace-Readers Digest Award. 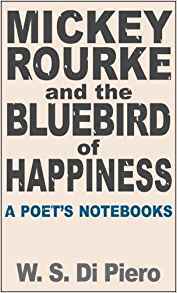 Mickey Rourke and the Bluebird of Happiness contains selections taken from Simone Di Piero’s notebooks going back thirty years. His notebooks offer evidence of a poet’s inner life and have been for him a kind of mute conversation partner. They testify in an episodic way to one poet’s encounters with the world. Di Piero’s materials include life’s personal day-to-day debris, as well as reflections on the art of poetry, painting, photography, music, the American character, and urban life. Mickey Rourke is a still-in-progress excavation of the contents of consciousness. No one sounds like W.S. Di Piero. Explosive language, rough sensuousness, unflinching eye—here is a poet who will not look away, and who is always committed to poetry’s first purpose: to bring song. 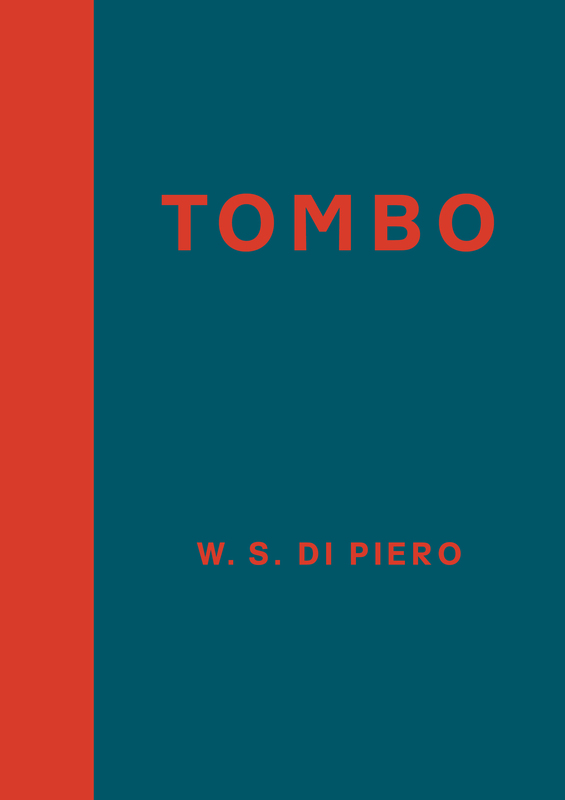 Tombo is a book of lyrics fueled in equal parts by realism and big-fish storytelling, a book of wanderers, foghorns, summer rain, feral cats, and city jazz. Built on heartbreak particulars, these poems are raw, mysterious dilations of the moments of existence. Night of Shooting Stars is the definitive edition of Leonardo Sinisgalli s poetry in English. Selected, translated, and introduced by W. S. Di Piero, this bilingual collection represents work from each phase of Sinisgalli s career, giving readers a comprehensive look into one of Italy’s essential 20th century poets. When Can I See You Again is a collection of Di Piero’s recent short art writings on subjects ranging from Morandi to Rembrandt to Pre-Columbian marine animal amulets. Di Piero has great zest for looking and a prose style equal to what he sees. W.S. Di Piero marries a streetwise, working-class sensibility to an intellectual rigor and precise language in poems that stare down depression, failed love, and urban nightlife. In a fast-paced, half-cracked/half-sane style reminiscent of bebop solos, Di Piero forges masterful poems that “keep it close, loose, and sweaty,” and restore life’s intensity while showing where real hope might be found. weave us into wakefulness or dump us into distraction? When a self-proclaimed “lazy scholar” embarks on a trip through his life’s influences—as diverse as girl-group doo-wop, Yeats, and Van Gogh—readers are in for an illuminating ride. This collection of essays from cultural critic Di Piero veers from his early years as the son of immigrants in Philadelphia to his working life in art, film, music, and poetry. Along with a few choice essays reprinted from out-of-print collections, Di Piero’s new work shows him to be insightful about himself and his work despite his protestations against the “boosterism” of autobiography. Through the lens of his sharp artistic analysis, readers see his story—an immigrant story filled with the music and mystery of a multilingual family, the men of his neighborhood wearing so many hats as they worked—as the auspicious beginning for his life of observation and revelation. His prose sings along, tripping across slang, poetry, and painters with the same precision that allows him to nearly dance about architecture. Though Di Piero would claim that his life’s path “lurches and swerves,” his essays prove that he has wandered expansively and with purpose—a city dog trotting across continents, along pages, and through galleries. to greater goods, dreaming of how we stand here watching them. He told, he didn’t suggest or ask. he demanded to look clean and spare. We die with habits of self-regard. then pass into time’s menthol airs. lightly on the cabled throat. what love will bring back in time. Like most writers, when I’m working well, I’m in a fugue state, unaware of remembering or forgetting. In a fugue state, neuroscience tells us, one is unaware of having lost all sense of personal identity. It’s also physically dissociating, dreamily so—chronic pain I’ve lived with for thirty years subsides, as it does in beatific dreams—and I’m living in lost time, in oblivion induced by the process of work. It’s a form of inspiration, an auto-hypnosis instrumented by Muse or God or neural network. (It’s not peculiar to writers and artists: mathematicians, systems analysts, and cabinet-makers experience the same state.) I get lost in the now but lost to something past, since writing is practically all recovery. I look down at whatever’s under my nose, then look up and it’s three or four hours later. Where have I been? In what labyrinth? In the autumn of 1995 I fell into despair. How else to say it? The constellated symptoms were those of severe clinical depression, but no aetiology can really accommodate the dimensions of the failure of hope. Hope not as a mood but as a casual existential assumption of life’s continuity that lives in the spirit like involuntary reflex, like breathing. It wasn’t my first time and wouldn’t be the last. Anybody who falls once has usually fallen before and will sometime fall again. The circumstances aren’t important any more, only the recognition that the despair stopped the ordinary circulatory motion of life in me and the physical world around me. Every soul experiences the death of hope in its own way. The wire can be tripped by the most trivial occurrence. I can’t find a pencil, someone’s line is busy, I burn the shirt I’m ironing, no mail comes. The gashing pain that ensues is so out of scale to its occasioning event that the pain can seem operatically silly. All the casual manipulations by which we cinch and stabilize our daily lives melt away into a formless, quivering, all-covering woundedness and frailty. I didn’t wish it on my self and never thought what a dandy subject for poetry it might be. I wanted to be rid of it or it to be rid of me, and the longer it lasted the more it was like an evil smelling visitor to whom I owed some inexplicable obligation of hospitality. even when it doesn’t stir. It’s a memory of the day. These absences keep us alert.